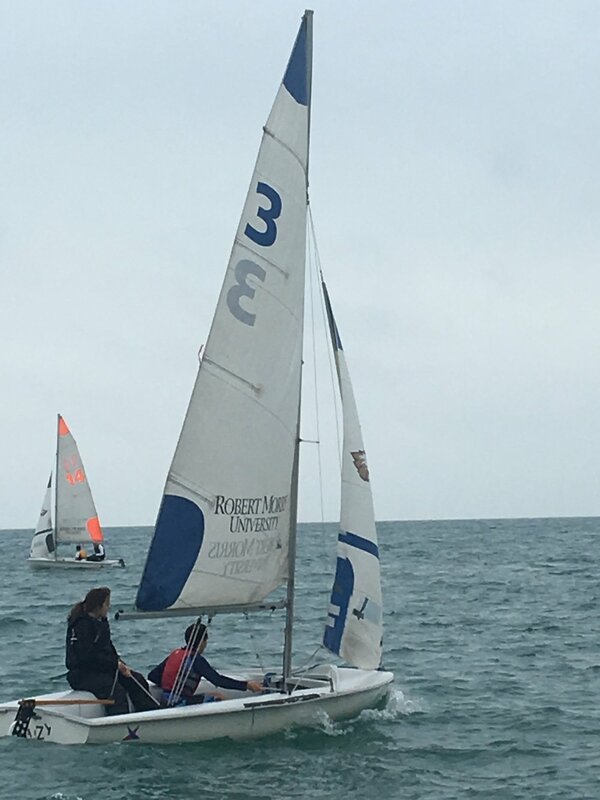 Last weekend, the Fenwick Sailing Team finished up its season with the Shepherds Championship at Columbia Yacht Club, sailing in cold temperatures and oscillating wind. Team members John Hultquist and Maura Hopkinson placed 2nd in A-division, and Patrick Kelly, Liam Soule and Cece Carl sailed well, too. Anyone interested in joining spring sailing should reach out to Mr. Hackman-Brooks. Spring sailing starts mid-March and runs into May. Last weekend, the Fenwick Sailing Team raced well at a regatta in Lake Forest. The Friars finished overall with a respectable mid-fleet position in a tough fleet. The Sailing Team is looking forward to their last regatta of the season coming up in November. If you are interested in spring sailing, please contact moderator Mr. Hackman-Brooks at mbrooks@fenwickfriars.com. The Fenwick Sailing Team competed at the Autumn Classic at Belmont Harbor this weekend. The A division, sailed by John Hultquist, Maura Hopkinson and Will Carl, had many high finishes as they took advantage of the consistent breeze. Rounding out the team were Liam Soule, Cece Carl and Patrick Kelly who had great races as well. All in all, it was a fun weekend out on the water for the team! 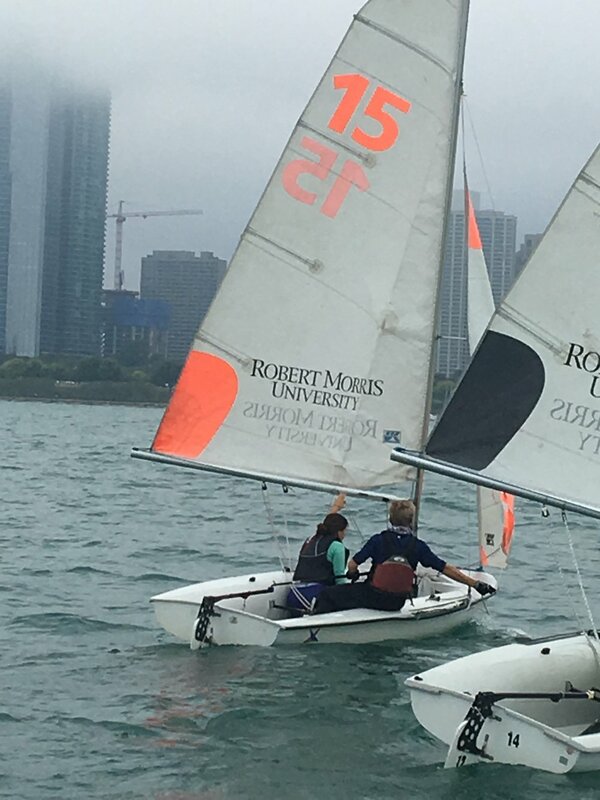 This past weekend, Fenwick Sailing Team members John Hultquist and Maura Hopkinson went to Columbus, Ohio, to compete in the MISSA Great Oaks Qualifier. With winds light and variable all weekend, the first day was tough for the team; but, they came back on Sunday with many high finishes, including coming in 2nd for the last race of the regatta. 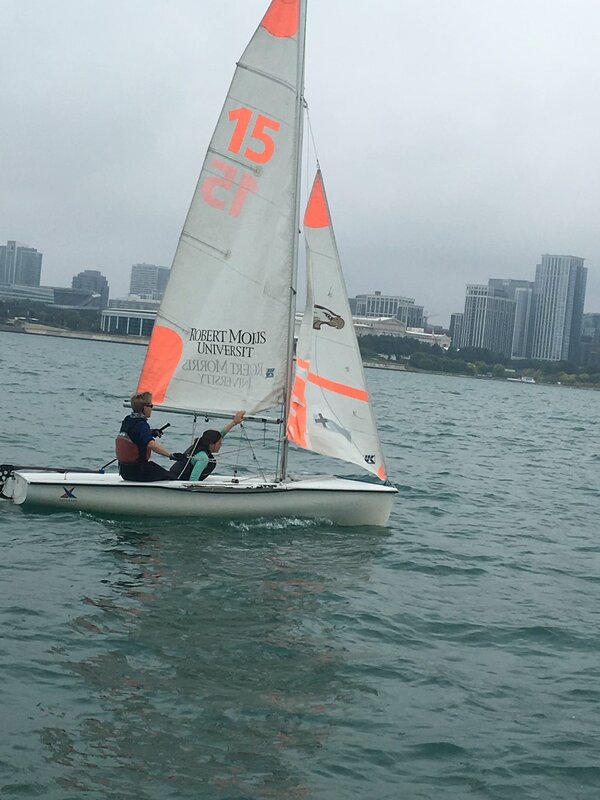 Last weekend the Fenwick Sailing Team had its second regatta of the fall season. Sailors Liam Soule, Zack Ozga, Patrick Kelly and Maura Hopkinson went to Culver, IN, where they sailed well and had fun. John Hultquist attended the MISSA Cressy Qualifier in Macatawa, MI, and came up just short of qualifying for a spot in nationals. This past weekend Fenwick Sailing Team members John Hultquist, Maura Hopkinson, Liam Soule, Zach Ozga, Cece Carl, Will Carl and Patrick Kelly sailed at the Fall Scramble in Pewaukee, WI. Given the tough conditions with light and shifty wind conditions, the Friars took fourth place overall out of 28 teams across the Midwest! Fall Tryouts will take place on Wednesday, August 22nd! Be sure to contact captains Maura Hopkinson or John Hultquist if you are interested in tryouts. Tryouts are not necessary to be on the team, however, if you do not attend tryouts you will be placed on JV. See you all on the water! 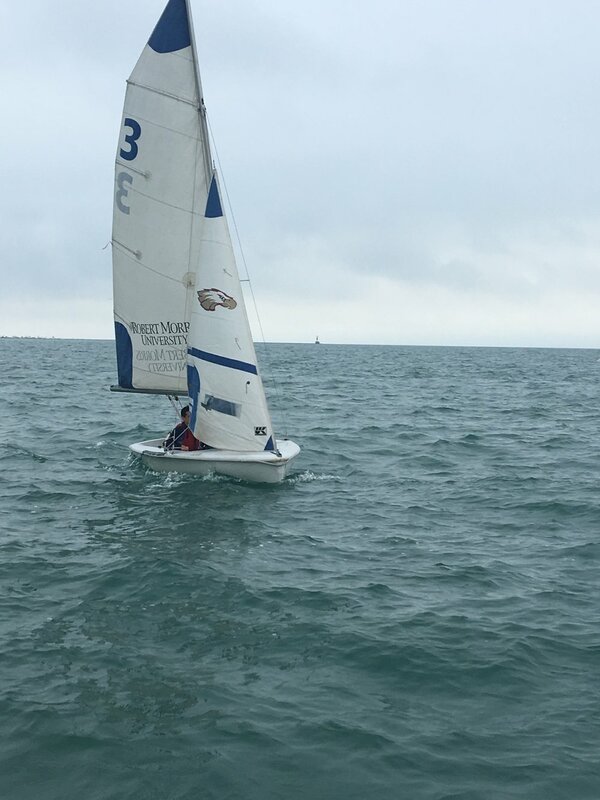 The Fenwick Sailing Team wrapped up its season this past Saturday by competing in the Illinois State Sailing Championship held at Sheridan Shores in Wilmette. Sailing in challenging conditions of heavy fog and winds that were light and shifting, the Friars rose to the challenge in both A and B division racing. Senior Harry Bearrows skippered the A Division races and finished in 2nd place after completing three races. In the B Division, sophomore John Hultquist also skippered three races and finished in 3rd place. Assisting both of these skippers as crew on a rotating basis were freshmen Aidan Janc and Patrick Kelly. The results for A and B Division put Fenwick into a tie for first place overall with Walter Payton College Prep, but the head-to-head tiebreaker resulted in a very respectable 2nd place overall. It was a very exciting finish to a successful season for the sailing Friars! This Saturday is our Second Annual Trash Bash – we’re hoping that you will be able to come down from 8am-10am to help clean up the harbor area. With the weather we’ve had lately, there’s a good amount of debris around the harbor and adjacent parking lots, as well as the surrounding areas. If you have work gloves, please wear them. We have thin rubber gloves for people to wear, but they are not warm. Please wear warm clothes, as we’ll be outside the entire time, and it’s supposed to be under 50 degrees and cloudy. Coaches will sign off on service hours for any student volunteers – We really want to make an impact – so let’s see how much we can clean up! We will be hosting a Spring Sailing information session in the Fenwick Cafeteria on Tuesday 2/27 at 7pm! Our coach Katie Tinder, a representative from Crowleys, and our captains will all be there to answer questions! It is important everyone registers prior to our first practice day on March 17th. We need to spread out and roster the practice days for sailors, and this is dependent on a lot of factors starting with knowing who is participating this season. Sailors participating for their first season should plan on joining the developmental practices. Though it is likely a lot of sailors will be joining us on the past seasons schedule, we do plan on moving sailors around as our Spring enrollment is different in size and skill from the Fall. These are not mandatory, but free to all sailors and interested sailors. We plan on unpacking the equipment and rigging the boats for the Spring season. This will work much like our pack up day, sailors will meet in the morning at 9am and we will plan on having a potluck lunch after we complete the rigging around 12 or 1pm. We will be inviting a gear vendor down to display and sell gear if families are interested. There is no obligation to buy, but a good way to get sizes figured out and see what gear is needed. *Regular practices will begin after the March 17th unpacking/rigging day. *Sailors will be placed into a practice schedule by March 17th when we have an idea of who is participating. Sailors can and will be moved depending on many factors such as; attendance, attitude, work ethic, skill, etc. Please fill out this google doc if you will need a parking pass. Parking passes our only valid during practice hours and MUST be displayed. We will be sending out a potential schedule for events this Spring. We will ask every sailor, regardless of which group you are practicing in to fill out the availability forms. This is mandatory if you wish to participate in competition, if you do not wish to participate in competition you do not have to fill the form. Filling out the form is NOT a guarantee your athlete will be rostered for an event, but with over 100+ kids it is the best way for us to roster available athletes for a competition. We will do our best to find opportunities for sailors to participate in events. Congratulations to Fenwick Sailing Team members Harry Bearrows, Maura Hopkinson and John Hultquist, who traveled to the MISSA Great Oaks Qualifier in Wayzata, Minnesota, where they qualified for the championship fleet and had one of the best regattas in team history. This past weekend, the sailors showed up for a regatta downtown at Belmont Yacht Club, but were stormed out on Saturday. They returned ready on Sunday with Bearrows, Hultquist and Allison Lang in A division, and Maura Hopkinson, Hultquist, Samantha Schak, Patrick Kelly and Brendan Conboy in B division. Team members look forward to competing more this fall and extending their sailing experience into the spring season. Prepping for the Pewaukee Regatta this weekend! Good luck to our team members that will be going! Sail fast!! The signup for Fall Sailing is now up! Please go to THIS link to sign up! Practice starts on Monday August 28th. Tryouts for Fenwick are going to take place on August 23rd. We had a successful End-of-Year sailing banquet for all members of our 2016-17 team! Thank you to everyone who made this possible, especially the parents and Mr. Hackman-Brooks! Many of our sailors received varsity letters awarded by the school, as well as paper plate awards made by other members of the team! Check out the pictures from the fun evening on the home page! Here's to our Central Mallory Fenwick Team: Sat: Quinn, Gavin, Maura, John, Clark. Sun: Harry, Gavin, John. Thank you parent chaperones: Kathleen Wilson, Jim Hopkinson, Shaughnessys on Sat. Sun : Kathleen Wilson, Deb Hultquist. Great job guys and thank you to everyone involved, as well as congratulations to everyone who participated in the Icebreaker last weekend!! Spring Sailing Rigging is on March 18th, 2017 beginning at 12pm for sailors. there will be lunch served and parents are invited! Quantum Sailing is bringing in Terry Hutchinson to Columbia for a talk on Thursday, March 23 at 7pm. This is a free seminar and Terry is one of the world’s best sailors, so there should be some good information. We will be hosting the Spring informational meeting on Thursday, February 23rd, 2017 at 6pm in room 17. There will be a coach from Columbia Yacht Club, as well as a representative from Crowleys to speak about drysuits and other gear. Save the date! The rigging of the boats for the spring season is around the corner on March 18th, 2017! Come out for a day of discussion, introductions, and lunch! Thank you to Quinn Shaugnessy '17 for attending the mock trial this Saturday and representing Fenwick Sailing! The Banks Blackwell regatta was held at Culver Academies, and our team placed 3rd for A division! Good job Fenwick Sailing! 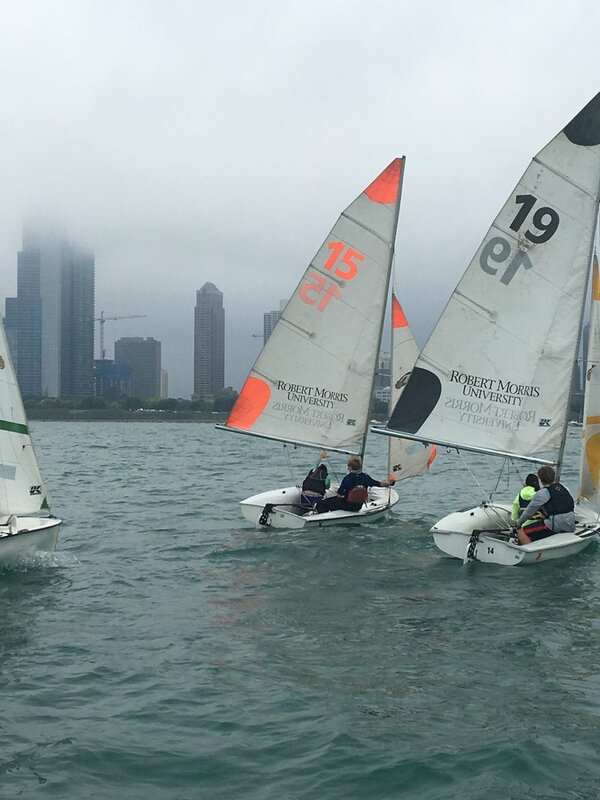 The team participated in the Autumn Classic Regatta held at Chicago Yacht Club this weekend. This was the first race for some of the members and it couldn't have been a better learning experience! This weekend Harry Bearrows and Maura Hopkinson competed at the Great Oaks Regatta in Wayzata, MN and placed 1st for Silver Fleet. Congratulations Harry and Maura! We will be having our yearbook pictures taken this Wednesday at 5.20 p.m. in the gym. We hope to see you there! FENWICK SAILING TEAM--Please join us in the cafeteria on Thursday August 25, 2016 from 6.30-7.30 for our informational presentation about Fall Sailing! Our new moderator Mr Mark Hackman-Brooks will be in attendance as well as Columbia coaching staff, representative from Crowley's for gear, current team members and families. As noted earlier, Sailing is a co-ed, no-cut sport, and past experience is not required.